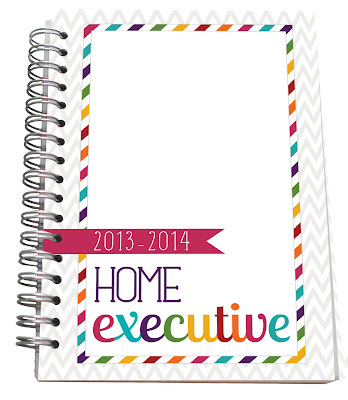 Hello, Hello all my WONDERFUL Home Executives! Oh my heck! 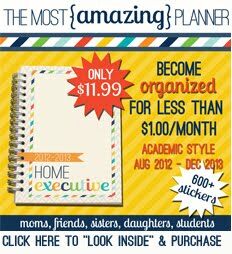 I am so excited for the 2013/2014 planner to come out. My publisher just let me know that everyone will be able to pre-order on June 8th! That date is going up there in my planner for sure! :) When you do order, you will be doing so through my "shop" button above. We have a bunch of giveaways in the planning stages for lots of my blogger friends and I will be sure to post those on this blog as well. Most of the giveaways will be happening in July, so keep checkin' back for your chance to win a free planner! Below are the new colors of this year's planner, but other than that there are not many changes. There are new delicious recipes of course, and there is now one page of stickers instead of two. Oh, and I included the holidays throughout the week spreads as well as your monthly spreads. The flip-through online version will be up soon for you to look through. Happy planning everyone AND Happy Mother's Day this weekend! 3 comments on "2013/2014 Home Executive Day Planner"
Awesome! Cant wait to order my next one. I've loved mine! Love the new colors! I'm so excited for the new planner! I purchased my planner last year at BYU education week. One of my very most favorite features of the Home Executive planner was the sticker pages. I'm a little sad there will only be one page of stickers for this year's planner, but I'm sure it will still be great. Thanks for creating such a fun tool!